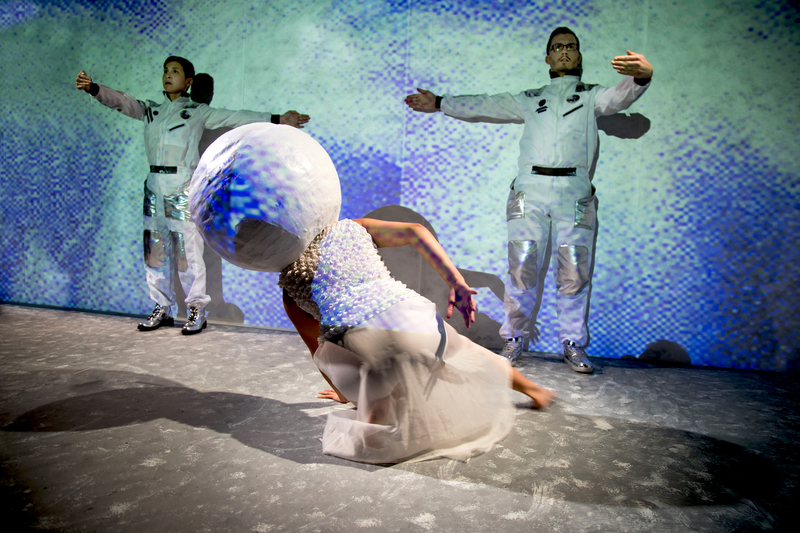 Mugwumpin’s production of “In Event of Moon Disaster” brings the audience and the players on stage with multiple video projections, space walks, characters both serious and fantastic, dancing, speaking and singing…to produce a ‘one of a kind’ event at Z Below. The event is the result of two years of development with work-in-progress showings at Pro Arts Gallery in Oakland and Intersection for the Arts in San Francisco. “In Event of Moon Disaster” takes us into the possibility of being lost in space. The dialogue consists of talk between two astronauts in space, Stephanie DeMott and Soren Santos, and three other astronauts played by 14-year-old Nayeli Rodriguez alongside Erin Mei-Ling Stuart and Don Wood, who are tracking the space explorers’ journey from Earth. All these performers are effective. Stuart is an amazing dancer/actor who holds the work together and provides the human poignancy. Rodriguez gives us the up-to-date facts; she was chastised for her desire to become a girl astronaut. Wood charmingly reminds us of life’s daily work efforts. The script, devised collaboratively by the members of Mugwumpin, provokes the imagination on the level of scientific data, raising the issues of safety, terror and philosophy in space. The astronauts are lost, and their colleagues on Earth are concerned but helpless. They are curious and reflect their own condition on Earth and the consequences of any disaster, personal, private and in the universe. All the players move on and about the stage space and eventually into the house while the audience moves also, around the set and finally onto the stage. The moon appears as a dancing woman with a giant round ball on her head. The other cast members are dressed in space suits. The narration goes back and forth between them all, repeating messages and lines, making us aware of the unique relationship we have to space and to each other. It is all very enchanting, although sometimes the words go on too long and lose effectiveness. Yet the visuals, the performers’ commitment to the play and the direction by Natalie Greene is imaginative and unique. All the technical and production staff deserve special applause as do the talented and charming cast. P.S If you like throwing ping pong balls, this is your chance!